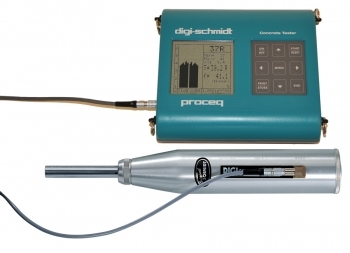 The Schmidt Hammer Digi-Schmidt Type ND was developed for the non destructive measurement of the concrete compressive strength and controlling the uniform concrete quality. Besides showing the basic settings on the included display unit, the Schmidt Hammer offers the transmission of the measured data to a standard printer or to a PC. This supersedes the time consuming business of note taking allowing the user to focus on the essential. The window based software ProVista allows downloading, presenting and editing of the measured values in a fast and easy way.